I feel small, insignificant, unable to make a difference. And so I look up for inspiration and guidance, perhaps even for a bit of escape. I long for a trip out of my busy whirling circling thoughts that go nowhere. And oh, I see the view. A grand wide open sky which spreads from one horizon over all my world, to the next. This is a sky with hope and promise. This is a sky that uplifts. And now I am dwarfed, and my thoughts have stopped their circling. I take a deep breath to take in as much of the clouds as I can. This is a good day. Thank you Majesty, and Power on high! 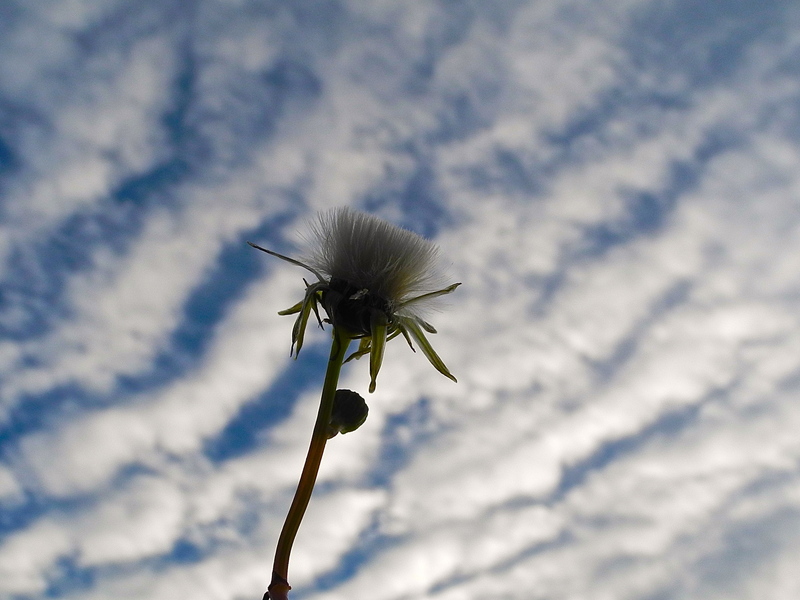 I may be small but now I feel grand to receive the blessings of your sky to enjoy. Sometimes being small is a great gift. Your weeds are so insightful to their life and ours. Beautiful writing as always. Hi Rose, that’s surprising. My site is still up and all is A-okay. I’ll look into seeing what might be the problem though.